THE GOVERNMENT IS to expand dental care for Irish children under the age of six in a new scheme due to be launched today. Health Minister Simon Harris will also announce packages of care for children from birth to 16 years of age. Currently, the Public Dental Service (PDS) provides emergency treatment to all children under 16 years of age and routine dental examinations for school children at certain periods. Under the School Dental Screening scheme, which currently exists, dentists only visit primary schools each year to see children in second, fourth and sixth classes. Children are examined and given a grade depending on how quickly the child needs treatment. The child is then referred to a local HSE dental clinic to receive treatment. Under the current scheme, children are entitled to just three routine screenings. However, the Irish Dental Association (IDA) has said that in practice very few children receive all three screenings, and often children only receive two screenings in their early years. This is largely blamed on austerity measures introduced in the wake of the 2008 crash, which saw massive cuts in services. For example, in 2015, at least 16,000 primary school children who were due a school screening did not receive one. In addition, every year, the association said some 10,000 children are undergoing painful operations because routine screenings are no longer taking place and issues are not being identified in time. 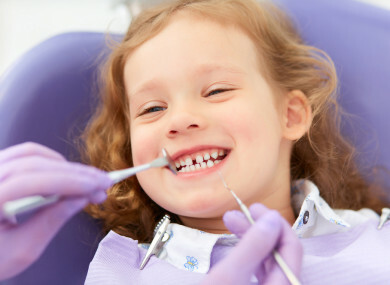 Irish Dental Association chief executive Fintan Hourihan previously told TheJournal.ie that the average age for children undergoing such extractions is now just six years old. “Some children are having more than nine teeth extracted,” he added. Under the changes being announced today, contracted local dental practices will replace the existing Public Dental Service (PDS) school programme. Rather than a simple screening, a package of care for children from birth to 16 years of age will be rolled out. The packages will include examination, preventive advice, referrals, prescriptions, fillings and extractions and assessments including orthodontics and oral surgery. Firstly, the government plans start rolling out to children under the age of 6. This will begin in 2020. The minister also plans to improve access to primary care services and oral health for all vulnerable groups. Currently, the Treatment Benefit Scheme which allows for a dental check-up for a nominal fee is available to insured workers, the self-employed and retired people who have the required number of PRSI contributions. Medical card holders are entitled to a free dental examination in each calendar year, as well as any extractions that are required. Two fillings are covered in each calendar year. Harris wants to also provide a preventive package of care for all eligible adults at different intervals during their life. One of the country’s most senior dentists previously told TheJournal.ie that the lack of appropriate dental care for the elderly is causing “untold damage” to the oral health of thousands of nursing home patients. Very often the situation has reached crisis proportions by the time I’m called in and I have to take out 15 to 20 teeth over a short period of time. Concerns have also been raised this year in relation to a 20% decrease in numbers of dentists working in the public dental service. The minister said he aims to support the profession in implementing the new policy by evaluating both undergraduate education and the skills available in the workforce. It is aimed that the delivery of the vast majority of services, for both children and eligible adults, will be in a primary care setting by local dental practices contracted by the HSE. This will move the services largely to dental hospitals, other hospitals and designated primary centres, which will be designated as advanced oral healthcare centres. Under the new plan, eligible adults will continue to receive their primary oral healthcare from a dentist of their choice. The main change being announced today, is the focus on preventative measures, with the government planning a “gradual shift” beginning next year, which will result in a similar model of service being rolled out for both children and adults across their lifetime. Email “To avoid 'traumatic' extractions, government set to expand dental care for kids under 6”. Feedback on “To avoid 'traumatic' extractions, government set to expand dental care for kids under 6”.